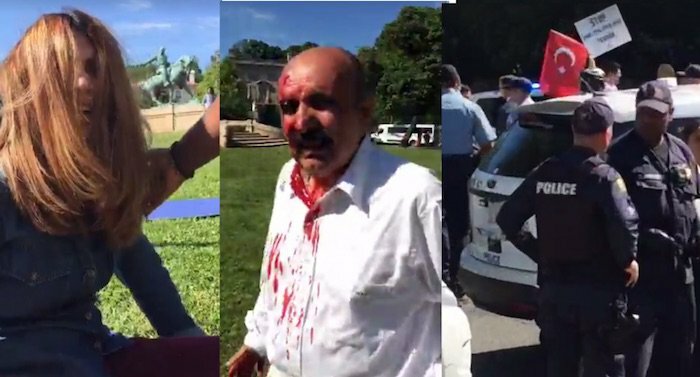 A pro-Erdogan group of supporters who had gathered outside the residence of the Turkish Ambassador in Washington, DC, broke off the police line and attacked a group of peaceful protesters. Many groups including Kurdish, Yazidi, Armenian and Greek organized protests during President Erdogan’s visit to the US, that included a meeting with President Trump at the White House and a dinner in his honor. Below you can see one of the many videos that surfaced and show a “close-up video of the pro-Erdogan contingent attacking Kurdish, Yezidi and Armenian human rights protesters in DC,” according to the Armenian National Committee of America. According to other reports from the scene, attackers were not simple protesters but folks with military training, “likely from Recep Tayyip Erdoğan’s security detail,” the group wrote in a statement. This is a deveoping story, more to follow.